Since diet contributes to a varying degree in the formation of kidney stone, dietary recommendations for kidney stones are extremely important. In some, modifying one’s diet with multiple risk factors may be all that is needed for stone prevention while others will require specific medical treatment with dietary measures serving as an important adjunct in the overall effort in preventing future stones. For years, the focus in dietary prevention has been calcium restriction; this is not needed in most patients with calcium stones. Unless specifically indicated, as evidenced by detailed medical evaluation, calcium restriction may actually promote stone formation and should not be undertaken unless directed by your physician. The following recommendation serves as general guidelines for those with calcium stones; however, since individual needs may vary, we recommend you consult with your physician prior to initiating any dietary restriction. Enough fluid to produce 2000 to 3000 cc of urine daily, this is the equivalent of 2 to 3 quarts or 60 to 100. Please be aware that the volume that matters is the urine output, not the amount of fluid intake; in other words, if you sweat a lot, you need to drink that much more. This is especially true in the summer. Most kidney stones form at night! Remember how strong the urine smells when you first get up? Stone forms and grows best when urine is dark and concentrated, drink before going to bed so you have to get up at least once to urinate and drink again before going back to bed. During the day, drink 12 to 16 oz of water when you get up, with each meal, in between meals, and at bedtime. If the urine has any color or smell, you need to drink more. Drink water and avoid large amounts of tea or coffee. Salt, sodium chloride is excreted by the kidney in such a way that calcium follows salt into the urine at a 2:1 ratio. Excessive salt intake is among the most common factors we see in recurrent stone formers. Salt is everywhere! Read the label, you will be shocked at the amount of salt in our daily pre-packaged food and beverages; take Gatorade and V-8 vegetable juice for example. If your diet involves dining out or lots if pre-made food, your salt intake will already be excessive even if you do not add any additional salt. Hydrochlorothiazide/HCTZ: a mainstay in treating patients with excess urinary calcium DOES NOT work unless salt intake is restricted. As previously noted, calcium restriction is not needed in most patients with kidney stones. As a matter of fact, calcium restriction may be counterproductive. We recommend you continue with your regular calcium intake unless directed otherwise, assuming that you do not drink a gallon of milk every day or ingest a large number of Tums or Rolaids. The main sources of dietary calcium include dairy products, meat, and dark green leafy vegetables. Most female patients do not need to interrupt calcium supplement for osteoporosis prevention, check with your physician prior to making any changes. One should also avoid excessive tanning or sunbathing; tanning promotes dehydration and calcium metabolism by converting excessive vitamin D to the active form. Protein, especially animal protein, is very problematic; it promotes stone formation via a variety of mechanisms. Unfortunately, high protein diets of many permutations have ruled the current dietary landscape with no end in sight. 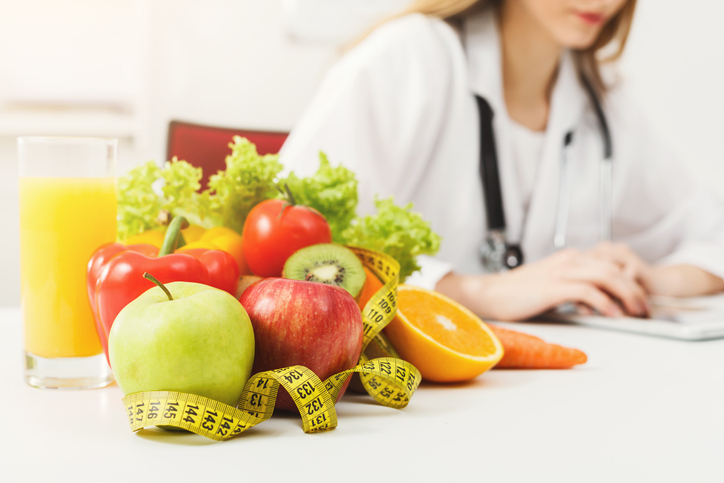 A recent study comparing various weight loss diet regimens showed that while the “Low Carb” diet may lead to quicker weight loss than others, over time, the net weight loss effects are equivalent regardless of the initial approach. My recommendation is to avoid the Atkin’s or the South Beach diets and consider a more physiological approach by incorporating a balanced diet with exercise to avoid the pitfalls of high protein intake and kidney stones. Limit your animal protein intake and if you love to indulge on a good steak, please double up on your water drinking. High level of urinary oxalate is perhaps the worst and the most difficult problem to have. We have only limited means of lowering the oxalate excretion since the bulk of the oxalate in the urine comes from body’s own amino acid metabolism. Dietary sources of oxalate include mega-doses of vitamin C, rhubarb, spinach, beet, peanuts, nuts, chocolate, celery, parsley, tea, and coffee. You may consume these items in moderation and please avoid binges of excess, stay well hydrated with water to “flush out” the oxalate that may get into the system the next time you indulge in chocolate, sweet tea or salted peanuts or nuts which contains both oxalate and salt, by the way. Vit B6 at 50-100 mg daily will reduce liver production of oxalate. Citrate is extremely beneficial in stone prevention and is safe. The best source of citrate is prescription citrate supplement such as Urocit-K or Natural citrate can be found in lemonade, orange, or grapefruit juice. The drawback with the natural source of citrate is the need to consume a large quantity of these food products in order to obtain enough citrate for stone prevention. Lemonade is the best given the fact it contains the least amount of oxalate. For those with normal urinary citrate levels not requiring pharmacological replacement, you may supplement with a large glass of orange or grapefruit juice 2 to 3 times per day including once before bedtime. Bran, especially corn bran, may be added to your Daily intake of 10 to 15 gram has been shown to reduce stone formation. Avoid wheat or rice bran, both contain a fair amount of oxalate. Magnesium is a stone inhibitor similar to citrate; dietary sources of magnesium overlap those of calcium that makes natural sources impractical. You may obtain over the counter magnesium supplement and follow the direction on the bottle. Do not over consume to avoid potential magnesium toxicity. Obesity is now a major contributor to stone formation. Various factors associated with obesity leads to high urinary calcium, oxalate, and uric acid; insulin resistance causes metabolic acidosis which lowers urine citrate. Shockwave lithotripsy is more difficult in obese patients from positioning the patients and localizing the stone and from shock wave losing its energy and effectiveness simply due to the distance it must travel to reach the stone. Please consult with your primary care physicians or internist re. weight reduction; as you undoubtedly know, overweight is a major health risk and kidney stones are of minor significance when compared with all the other health risks associated with obesity. Additional steps may be individually based after consulting with your physician. We hope you find these dietary recommendations for kidney stones useful! However, if you have any more questions or concerns, contact us here.